Another area of Wisconsin can now claim a case of the Emerald Ash Borer. 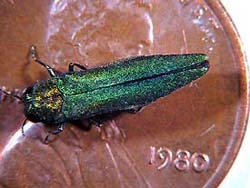 A suspicious beetle found in a survey trap in Green Bay last week has been confirmed as the EAB. Brown County is the fifth county to have a confirmed case. The others are just to south on the Ozaukee-Washington County line. The tree killer has also been found in the southwest counties of Vernon and Crawford. A state official says EAB&apos;s appearance there is to be expected as Green Bay through the entire Fox Valley is a popular tourist trap. Mick Skwarok, Plant, Pest and Disease Specialist with DATCP, believes visitors are probably bringing infected wood from other states. Skwarok says the state is consulting with the feds on quarantining the area. He urges people to find out more about the invasive pests, and methods in preventing them, on their website .